Types of rice you can find on the supermarket shelves. There are many types of rice. Each kind has different taste, texture and usage. Some dishes require specific types of rice to be prepared properly. Rice is a cereal that many people tend to take for granted until there is a shortage of this staple food. For example, during the Japanese occupation in Malaya during the World War II, there was shortage of food, and the people had to resort to eating a lot tapioca to replace rice. As a result due to the lack of nutrition, diseases such as beri-beri were rampant. In Malay culture, each grain of rice is revered. The rice is believed to have its own spirit. Therefore, in places where rice are planted in large scale, there is a festival to celebrate so that each harvest is bountiful. Children from young are taught to clean their plate and not to play with this food. Young nubile ladies are also expected to be able to cook rice properly, otherwise, she is a poor catch as a potential wife. (THAT is before the invention of automatic rice cooker). Rice is such an integral part of our lives. As a result, there are many idioms involving rice in the Malay language. The types of rice can be categorized according to the length of its grain (broken rice, short grain, long grain), its texture (glutinous or just simply starchy), the ways the rice is milled: whole grain, polished or not, where it was planted (in the valley or on the hill side) and also the country it came from. 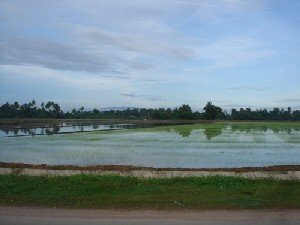 Most of the rice species need a lot of water to grow. 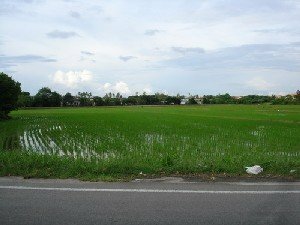 Expansive paddy fields in Kedah and Perlis have well irrigated land for this purpose. Rice needs different amount of water in its growth cycle. 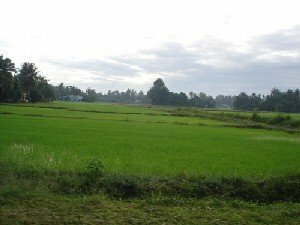 Therefore, it is interesting to see how paddy fields change with respect to the stage of rice growth. Nowadays, rice can be harvested up to four times a year due to advance agricultural methods. Rice field in the different stages of its growth. On the other hand, the aborigines plant a kind of rice which does not require plenty of water to grow. This rice is normally planted on the slope of the hill using slash and burn technique. We call it padi huma or padi bukit. I believe in the West, it is called wild rice. Now, we can see health conscious people hunting for organic rice, not in the wild, but on the supermarket shelves. What do you use these types of rice for? Besides eating, rice grains are used in many traditional ceremonies. I am sure you are familiar with the ritual of showering the newly-wed with rice for luck. Pulut kuning, which is glutinous rice colored with turmeric is compulsory in many events such as celebrating a new born baby, during circumcision ceremony or a wedding party in the Malay community. How do we prepare these types of rice for eating? I could probably write ten whole cookbooks only to mention the kinds of ways we can cook rice. This is a very versatile grain which can be used as the main meal, snack or even dessert. Rice grounded into flour also can be turned into thousands more delicious food, including many kinds of noodles, such as laksa. Now, you don't even want to get into the types of noodles we can make with rice. Your eyes would go purple with all the variety available. What is Hari Raya without ketupat or lemang (rice cake, either plain or glutinous)? What is sushi without the sticky rice? Who love rice porridge? Do you know that there are many ways to prepare this porridge, including one that is normally made during Ramadhan? I used to think that the English only know how to use rice to make rice pudding. Well, I was quite right. Since rice does not contain gluten, it is a good alternative for people who cannot take wheat based product. Rice is also more easily digestible than wheat. So, you see that even Nestle advocates red rice porridge for 4 months olds and above rather than the traditional wheat based cereal. Rice can be processed until it resembles very fine powder, therefore, very suitable for introducing semi-solid food for babies and later to wean them off milk. 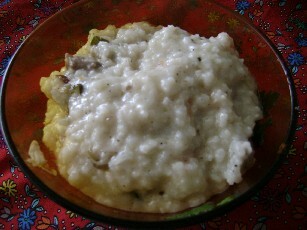 Rice porridge called "kanji", at other regions, there is another version	called "bubur lambuk". Here are the types of rice that you can find on the shelves of your grocery stores. Considering there are over 44000 varieties of rice worldwide, this is a very short list indeed. Some may be regional and sounds unfamiliar to you. Well, at least, you know that these types of rice do exist. Remember, the names depends on the milling processes, colors, texture or fragrant. And, where they came from or how they are usually cooked. These are the most typical types of rice with the husk removed and the germ also thrown out. It is such a shame because removing the germ means most of the vitamins are gone too. Besides providing carbohydrate, rice is rich in vitamin B2 and B6. It is also called polished rice. 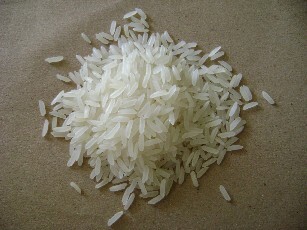 The type of white rice are divided into its length: short, medium or long grain. Broken rice can come from any types of rice. When rice is processed, some of the debris does not make the standard in grain length to be packed with the rest. It doesn't mean that the taste is no good. Good news is, it is cheaper than normal rice. When I was a student in Manchester, I always bought packs of 20kg broken basmathi rice. Yum, the rice tasted very good and also was very easy on my wallet. It is said that shorter grain rice is more sticky. Japanese rice used for making sushi falls in this category. Pearl rice, used for making western style rice pudding also is short grain. It is also good for making rice cakes or porridge. Basmathi that we use for making biryani is a type of long grain rice. Long grain is normally more expensive and reserved for special occasion. It has less starch and the smell is also very nice. Long grain may be soaked prior to cooking. However, please consult the packaging before you cook because recipes differ from one another. There are other types of long grain too. They are stated clearly on the packaging. Expect to pay more for this type of rice. This is everyday rice for daily meals. Normally it is white rice. You can steam it, cook it with the rice cooker or the microwave. Just follow the instructions on the package. Naturally colored with bunga telang when cooked, it makes perfect nasi kerabu. 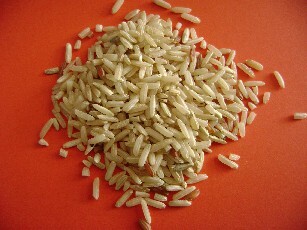 Basmathi rice is grown in Pakistan or Northern India. The water used to irrigate the rice fields come from the springs in the mountains. This is a very special type of rice indeed. Arborio is a type of rice from Italy and it is used to make risotto. What I know that this rice absorbs flavor well and creamy in texture. These two types of rice resemble Basmathi and are used mainly in Indian or Pakistani style rice dishes including biryani. I love brown rice. It has a nutty flavor, fills you up and rich in vitamins. Sadly, most people only eat this rice when they have diabetes or heart problem. There is a big difference in taste if you compare organic brown rice with non-organic ones. Even by eyeballing the grains you can see the difference right away. This rice takes a bit longer to cook than polished white rice. You also need to put a little more water than usual because the grain is harder. You may also soak the rice for about 20 minutes before cooking to shorten cooking time. In Malaysia, nasi dagang, a yummy rice dish from Kelantan, use one part of red glutinous rice to three parts of white rice. This beautiful rice, steamed with coconut milk and spices is truly out of this world. If you ever visit Kelantan or Terengganu, do not miss to try nasi dagang. Anyway, in Terengganu, plain white glutinuous rice is used instead of red rice to make nasi dagang and the gravy that accompanies it also taste a little different. Bubur pulut hitam is a Malaysian desert, it is a kind of porridge with molasses and thick coconut milk. It is usually served during teatime. After downing a bowl of this bubur you will welcome a leisurely siesta very much *burp*. Jasmine is a fragrant rice. They are also called Siamese rice. It is well known for its delicious smell when cooked. It has long grain and is hardly sticky. It is good for making fried rice. When it is plainly boiled or steam, it is perfect to be eaten with Thailand style dishes. Need I say more? Besides white rice, glutinous rice is widely used in Malaysia to make into many types of dishes or cakes. Usually it is soaked overnight before it is steamed or cooked with coconut milk. There are many grades available and the better ones has longer grains and also taste much better. One of the ways to enjoy glutinous rice is to make ketupat, lemang or pulut udang. This is quite an unusual rice. Not so common in Malaysia. During processing, the rice is partly boiled and then packed. So, it takes shorter time to cook this rice. The color of the grain is yellowish. I guess this rice is meant for people who are pressed for time or too lazy to learn to cook rice properly. Aha, this is truly one of the types of rice that is very regional. It is normally found in the northern states of Perlis and Kedah only. Locally, it is called emping. It is actually young rice, husk removed, cooked (boiled) and then flattened by traditional wooden pestle. The color is light green. It is eaten simply by mixing the flakes with sugar and grated coconut. I love emping as a snack or during teatime. Forget about pre-packed cereals of rice puff sweetened with sugar and loaded with chocolate. In Malaysia, we have our own version: bertih beras. It is rice puff made into different colors and shaped into sweet rectangular cakes. It is also good eaten as a snack. I admit it is quite rare to find it now because other unhealthy snacks, because of massive advertising, are more popular. And finally, here is the list of food involving the types of rice which you can prepare using the recipes on this web site. The list will grow as I add in more recipes involving other types rice of rice as well.